What does an encounter with Jesus look like? We've heard about many encounters of ordinary people with a living Jesus. They are all throughout the Gospels: the call of the Apostles, the woman at the well, Zacchaeus, and so many more. These encounters with Jesus bring healing of mind, body, and soul. The courses of lives are forever changed. Jesus isn't walking the earth anymore as He did in the Gospels. Our world is full of packed calendars, multiple responsibilities and commitments, chaos, noise…Can we still encounter Him? Can we even hope that this is possible? YES, you can! Encounter Jesus: From Discovery to Discipleship. Fr. Dave Pivonka, TOR, is a nationally known author and speaker. He also leads pilgrimages to some of the holiest sites in the world. He spends much of his time helping others come to know God’s love for them through preaching, writing, CDs, and other spiritual outreaches. Father Dave’s books include Spiritual Freedom: God’s Life Changing Gift, Hiking the Camino: 500 Miles with Jesus, and Encounter Jesus: From Discovery to Discipleship. In the Fall of 2015, Fr. Dave released a new book: “Breath of God – Living a life led by the Holy Spirit.” Fr. Dave has held several ministry positions at Franciscan University of Steubenville and is actively involved in the highly successful summer conferences program. Father is a member of the Sacred Heart Province of Franciscan Friars of the Third Order Regular. 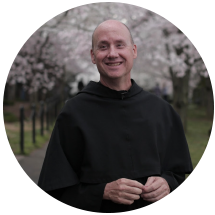 He is presently the director of Franciscan Pathways, an evangelistic outreach of his Franciscan Community. Just what exactly IS a parish mission? That's a great question, and one that many are asking now that we have a parish mission coming up in November. It would be great if every parishioner at St. Max could get away for a retreat for several days--to unplug and hit the pause button on all the rigors and bustle of everyday life. It would be awesome if every parishioner at St. Max could immerse themselves in a retreat that would offer an opportunity for spiritual renewal, revitalization, conversion, healing, and more. It would be great if that could happen, not only for each of our parishioners, but for our parish as a whole! Just like missionaries bring the gospel to those who haven't heard it, special speakers come into the parish to bring you the retreat that you cannot fit into your schedule. While the experience is somewhat different, the goals are the same as those of a multi day retreat at a retreat center or monastery. A parish mission can ignite a flat faith life and bring fire to serve our Lord back to the forefront. A parish mission can be an entry point for the person looking for the door to open on a faith that is barely the size of a mustard seed. A parish mission can breathe life into a languishing relationship with God. We've got you covered! You can stream it live or watch at your leisure. Just check out our StreamSpot Channel or click the link below. We've turned Fr. Dave Pivonka's talks from all three nights into podcasts for your easy listening. Come Holy Spirit! The Parish Mission is quickly approaching. Join us in praying this Novena for an outpouring of the Holy Spirit upon our parish before, during, and after the Parish Mission. View and print the novena below. Copies can also be found outside the Blessed Sacrament Chapel.